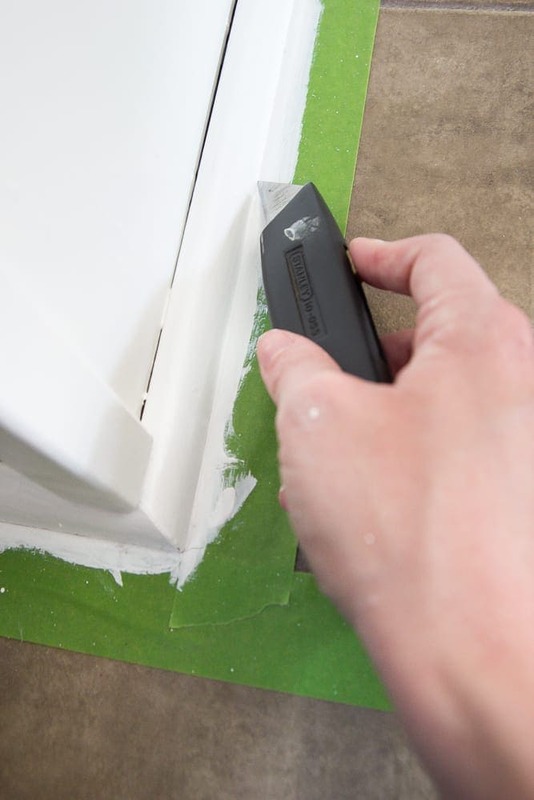 A complete step-by-step tutorial for painting kitchen cabinets to make them as durable as possible for as quickly and easily as possible. A huge thanks to Benjamin Moore and D Lawless Hardware for providing makeover supplies for this project. I spent a week painting kitchen cabinets. Almost exactly to the minute. And it was worth every Pandora karaoke jam sesh / paint brush dance party. Just in case you don’t remember where our cabinets started though, our kitchen looked like this just a couple of weeks ago. 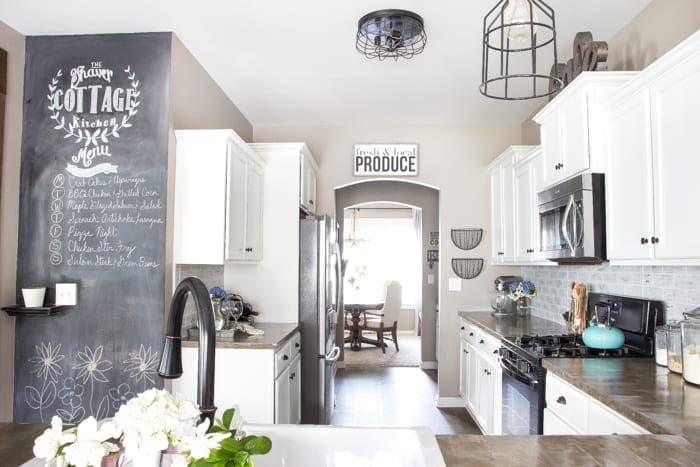 UPDATE: See the full kitchen makeover reveal here! Even though I’d already painted our bathroom cabinets last year, and they’ve held up perfectly, I felt like the kitchen cabinets were a little bit of a different story. We’re rough on these things. As in a three year-old slamming her tricycle into them on a daily basis and our bacon loving family cooking up all kinds of yummy but greasy goodness on the regular. These needed to be Hulk strength. So I read through as many tutorials and articles and professional cabinet painter tips as I could find to come up with my method to make them as durable as possible for as quickly and easily as possible. In all of the researching I could dig up, nearly every professional cabinet painter’s recommendation was Benjamin Moore Advance. It acts like an oil base by self-leveling, blocking stains, reducing wood grain raise, and sealing for durability while also acting like a water base with easy soap and water cleanup, low odor, low VOC, and not yellowing. Since we were working with white paint, that non-yellowing bit was really important to me. It’s not the cheapest paint on the market, but the quality makes it worth every penny. Cabinet paint is definitely not a project supply I would want to save money on if it means sacrificing durability. Before I went all door removal crazy with my power driver, I had to develop a system to keep track of which doors belonged to which cabinets since they can be tricky to put back up later when they’re finished if they’re not on the correct frames. So I sketched a very sophisticated high-tech illustration. (Haha! Not.) But it did the job. That “1BR” was code for Column 1, Bottom Right Cabinet Door, just in case you don’t speak that language. Wink wink. I labeled each door with a correlating number to my sketch as well as a sandwich bag for the hardware, so I could match them up later. And then our garage became Door Painting Central for several days. 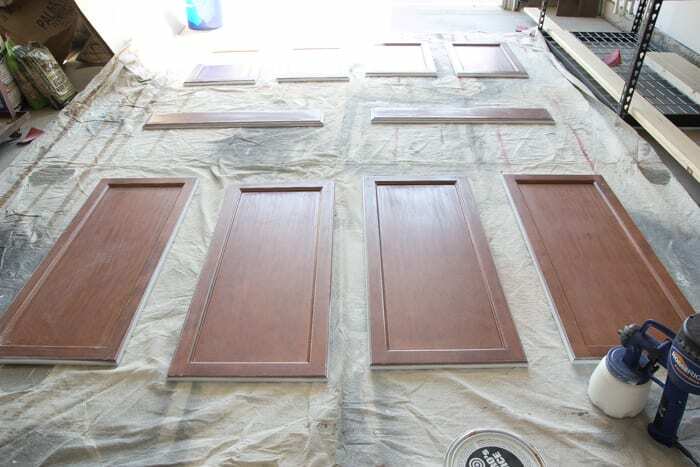 At first, I sanded a few of the doors, but truthfully, it was a giant pain, and after talking with a lot of others who’d painted cabinets successfully before without sanding, I decided it wasn’t really necessary. The degreaser and deglosser can do the job all on their own. 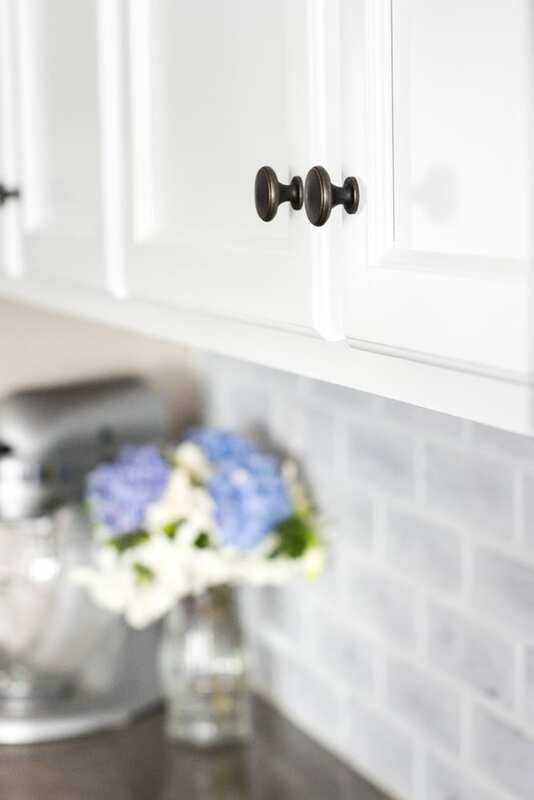 If you plan on using knobs and pulls that need different placements from your existing ones, your first step would be to fill those holes with wood filler. Then, I rubbed them down with the deglosser on a clean rag and let them fully dry for about 30 minutes. 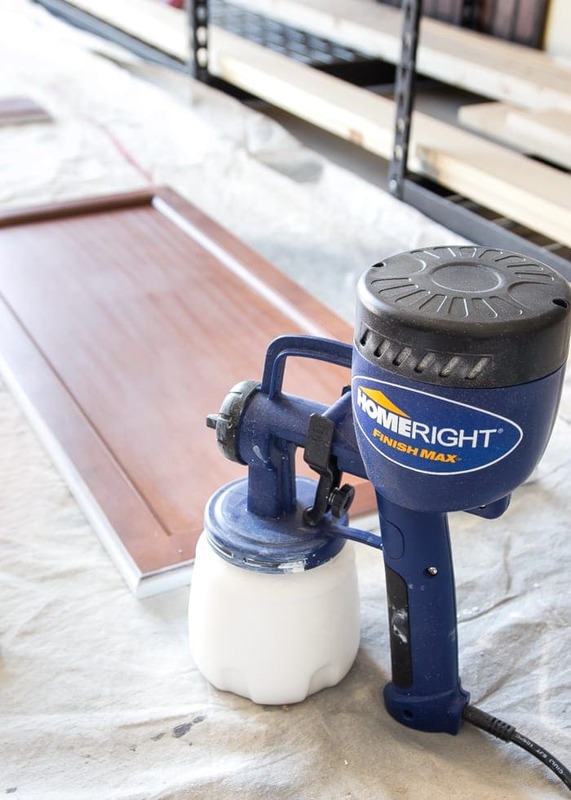 To make the painting process as fast and professional looking as possible, my HomeRight sprayer was the BEST! I don’t even want to know how long it would have taken me to paint our cabinets without this thing. I’d probably still be painting, truthfully, because what would have taken me about 10-15 minutes per door on a coat of paint with a brush and roller, took all of about 60 seconds with the sprayer. And we had 42 doors and drawers to paint, so you can imagine how exhausting that would have been. I primed the backs of the doors first by thinning the Smart Prime with about 10% tap water into the sprayer reservoir and stirred well. You can watch this video if you want a visual on how to use the sprayer, but it’s pretty straight forward. Just go easy and don’t apply too thick of a coat or the primer could start puddling. I let the primer on the door backs dry for 24 hours before flipping them over to prime the fronts. I let the door fronts dry for another 24 hours as well. Make sure to thoroughly clean your sprayer with a hose between each coat to keep it working properly. Then, I just repeated the whole process with the sprayer using the Benjamin Moore Advance paint. I thinned it with about 5% water and flipped the doors back over to spray the backs. I followed with a second coat on the backs 12 hours later and let dry for a full 24 hours. For the fronts, I repeated the process again- spraying one thin coat on the fronts, followed by a second coat 12 hours later, and letting dry for a full 24 hours. I painted the backs first just in case the finish would get messed up when I flipped them, but both sides ended up looking great with that 24 hour drying time. Just be sure you’re painting in low humidity weather conditions. When the frames were all dry, I scored the painter’s tape with a utility knife before removing the tape to prevent any peeling. 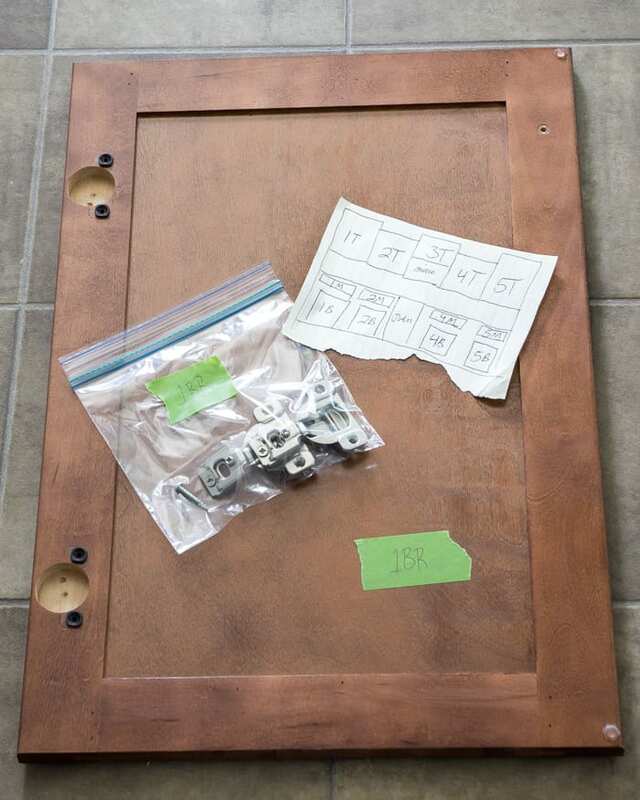 I added the hardware using a cabinet and drawer template, but I was a bad blogger and didn’t get a chance to photograph that step. Oops. I think I was eager to get this project done! Robert pitched in with me to help out with attaching the doors back on the frames with the power driver and then we did a victory dance smack in the middle of our newly bright white kitchen. Ahhhhhh! Literally 4 hours after hanging our last cabinet doors, we hosted a massive Memorial Day cookout. Because apparently we like to live on the edge. I am absolutely amazed at the difference in here. Since this space has no windows, it desperately needed a brightening up. We still have just a couple of little things to do in here like adding a runner rug and buying new counter stools (or making over thrift finds but I doubt I’ll get that lucky). Our doorway got a little farmhouse-y love with this cute produce sign from The Summery Umbrella though. I’m hoping we’ll be able to add under cabinet lighting soon too, but the jury’s still out on that one. We’ll see if the budget has any wiggle room later. But our knobs and pulls from D Lawless Hardware tie in perfectly with our industrial flush mount light and DIY cage pendant light fixtures. 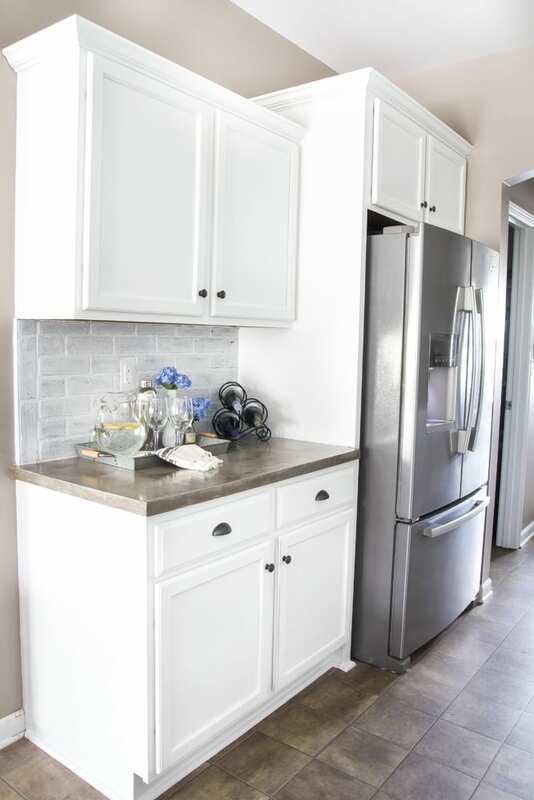 I’ll be sharing the full tutorial for our DIY whitewashed brick backsplash on Remodelaholic soon that only cost us $75! And if you missed them, I shared all about our DIY concrete countertops and our IKEA farmhouse sink and faucet a few weeks ago. Next week, we’ll be adding reclaimed wood to the stool side of our bar to tie in with our DIY wood beam doorway. And a stainless steel stove will be arriving soon to replace the black one installed by our builder. But in case you’re wondering, while snapping pictures of our fancy schmancy paint job in here, the watermelon slices didn’t last long. 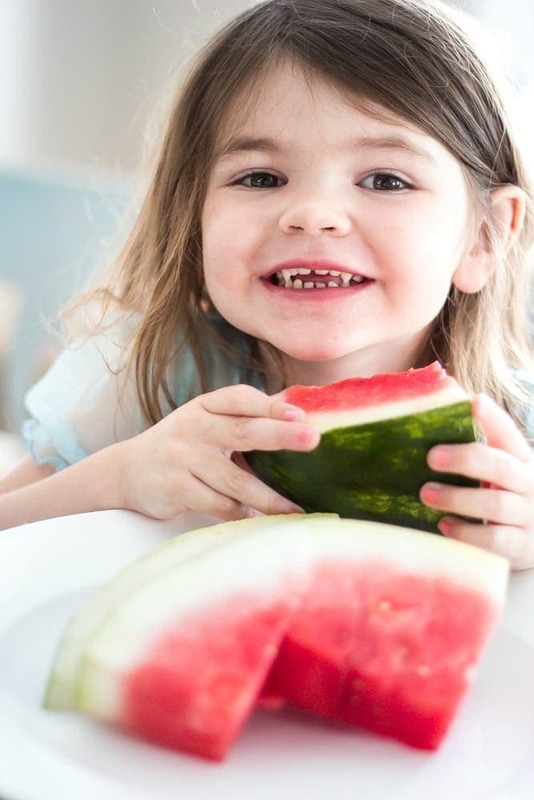 This girl can pretty much eat her weight in melon. We are soooooo close to this kitchen being finished! This one project was a huge leap from where we were before. Paint is magical like that, right? If you ever attempt to paint your own cabinets, I hope this one comes in handy. I’m sure I’ll be back in 6 months or so to share how they’re holding up, but I’m already really confident that they’re going to last for a very long time. It’s only been two days since we finished them and the paint has already dried to a rock solid finish. Woo to the hoo! Wow Lauren, your kitchen looks fantastic.! I think I need me a paint sprayer….. 🙂 And some watermelon.!! Yes! The sprayer is a game changer! And watermelon. Watermelon is a game changer too. 😉 Thanks, Min! Can you post the link to the backsplash?? I love it and just wondering how you did it? Huge difference Lauren! It really brightens up the whole room. 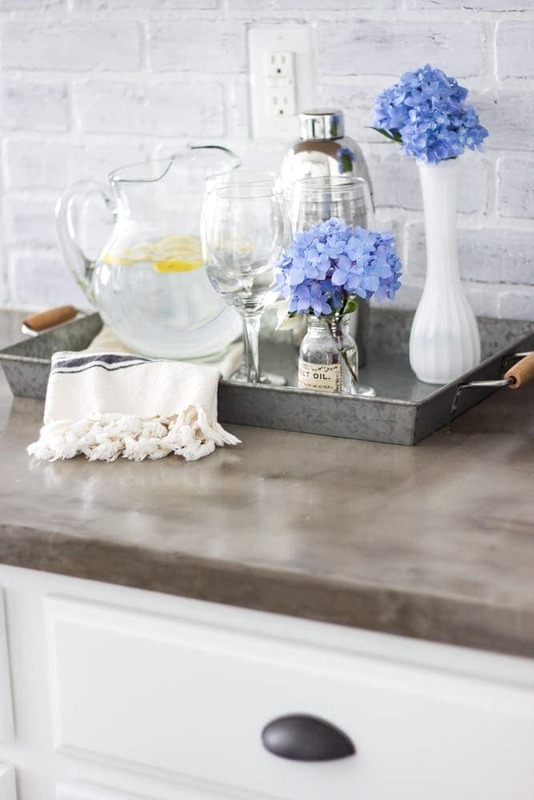 And the concrete countertop makes such a nice contrast to the white. showing it off to perfection. Can’t wait to see it finished with the stove in there. Thanks so much, Mary! We’re so happy with them. So ready for that stove to arrive! Not feeling the black anymore at all. Looks amazing! We had just used the same paint for our cabinets! I love it! Don’t you just want to stare at them? That’s what I do! Wow! What a transformation. I know it was a lot of work and living in a house that’s “under construction” – esp the kitchen – isn’t easy, either. Great job! Oh gosh yes! So glad I can cook again! I’m pretty sure I gained 5 pounds from eating fast food for an entire week. Eating out cost more than the actual project supplies. 😉 Thanks so much, Moriah! It looks so great Lauren! Paint makes all the difference. The transformation is amazing. I have painting my kitchen cabinets on the list, but didn’t get it done before the humidity hit Florida so it will have to wait until the fall. Right now mine are cream with a chocolate glaze, but I want brighter. Just curious, I’m on the hunt for a coffee cup holder and I really love yours. Where did you find it? Thank you, Laura! Same here. Paint is amazing. WOW!! It is stunning! Your talent, creativity and energy are amazing. You did a fabulous job!!! Thank you for sharing your journey and tips. You are so sweet, Lois! Thank you! THANKS for that! I want to paint my kitchen and bathroom cabinets white. This will help a lot! Oh wow! I didn’t know it got so humid up there. I got lucky this year. Normally, the humidity has already hit before May here in Charlotte. I envy the California dry heat! Thank you, Susie! I know. I think I gained 5 pounds from all that eating out we did since cooking wasn’t at all possible. Haha! All of the dinners out cost more than the actual project itself. Holy smokes Lauren! What a difference!!! They look incredible! All that hard work was totally worth it! Eeee!!! I’ve been so eager to see how they came out! It’s insane that that is the same kitchen 🙂 I’m still gearing up to do ours but unfortunately it’s summer in south Texas already and it’s humid as crap, but I’m not so sure I can wait till the fall. Congrats on a beautiful kitchen friend, your hard work is DEFINITELY paying off! Ugh! I know. I was working my tail off trying to beat the humidity since it gets sticky hot around here in the summer too. Thanks, love! Yes! Those are the ones I’ve been looking at getting! Glad to know yours are still doing well. I’m even more convinced now. Thanks for sharing your experience, Jennifer! 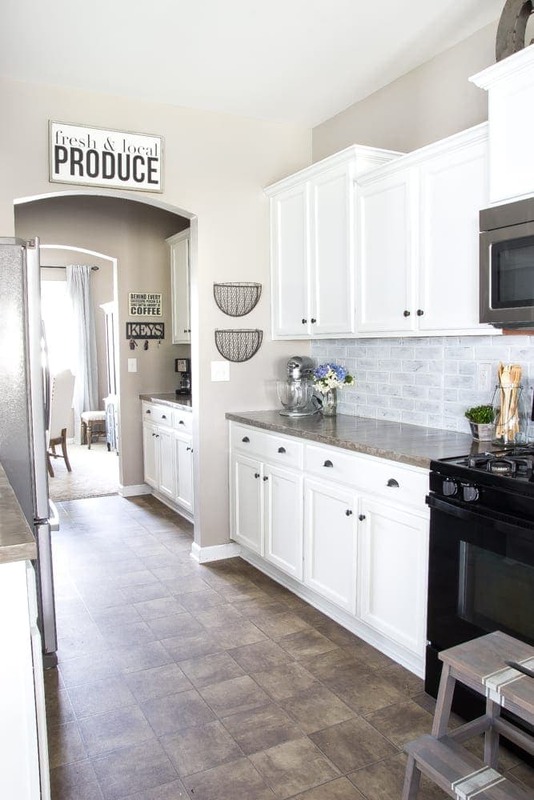 White cabinets totally brighten up this space I love it! Wow, Lauren, this is so so beautiful! My dream is a white kitchen! I have an ugly one right now and can’t take it. But white makes such a big difference and really brightens up the whole room! Love it very much! 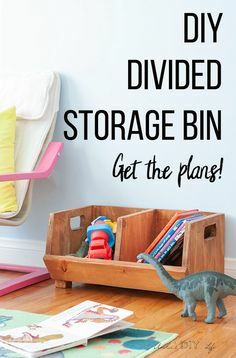 Your cabinets look amazing and I am about to do this same thing with a friend on her kitchen, so this tutorial came at the perfect time. All you need now is to paint the side of the cabinet that holds the microwave, a bit of brown is showing..
Oh Lauren, it looks amazing! I am so proud for you! It inspired me to get moving on my kitchen! Yay!!! Thank you, Lisa! So glad it could give you a little bit of motivation. It looks beautiful! 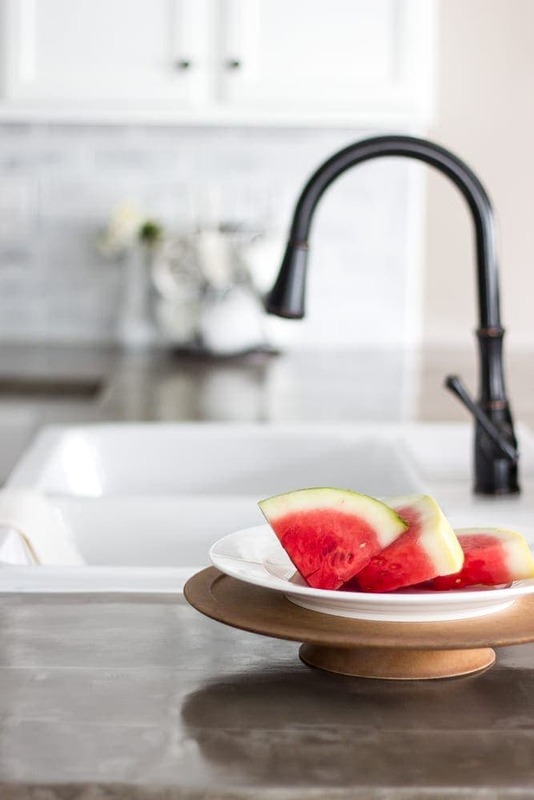 I love that farmhouse sink from ikea. We’ve been eyeing it ourselves, but when we bought our house last year it came with granite – which is a pain to remove ( I dream of butcher block countertops with subway backsplash some day)…and while granite is not my favorite in the world, it is just something we’re going to live with for now. But I love the look of yours. You did a really nice job of making it look homey instead of industrial with the counters. Btw-where did you find that fresh & local produce sign? I love it! Really beautiful…love the colors and everything..looks so nice!! Am anxious to see the blog on the concrete countertops. Your kitchen is beautiful! Love how your cabinets look. Certainly make it a lot lighter! We need to do ours too.A big job but worth it in the end. Thank you, Dianne! Yes, definitely a big job but you’re right. So rewarding. Oh wow!!! Awesome job!!! Great makeover!!! 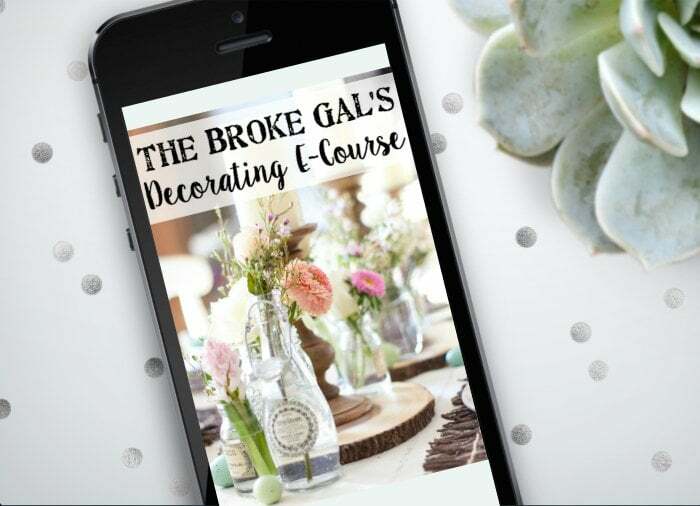 You do so many DIY projects that inspire!!! I you were working on this but I can’t believe how wonderful it came out ! You did an awesome job painting. White kitchens seem so much more inviting. I have the exact knobs and pulls. Love it all ? Thank you, Kathy! I can’t quite believe it either. 🙂 Same here. Some people say white kitchens are boring, but I can’t help but love how open and welcoming they are. Your cabinets look great and the kitchen is transforming nicely! Thank you, Colleen! We’re sooooo close! I love it, love it, love it. You nailed that kitchen makeover! Thank you, Ivory! We have just a teeny bit left to do. 🙂 Adding some reclaimed wood into the mix this weekend. Wonderful post. I’m wanting to paint my cabinets using the Advance paint and feel much better about my choice seeing your results. Did you have any issues with the paint sprayer? Great! It really is the best, in my opinion since it’s specifically designed for cabinets. The sprayer only gave me trouble once when I didn’t rinse it out well enough after a coat and let the paint dry a little bit inside of it. After I cleaned it out really well, it did great. This looks amazing!!! Such a difference. We’re going to have to repaint our cabinets soon enough. Thank you! It’s amazing what a gallon of paint can do. Love it, love it , love it!!! oh and the kitchen cupboards too!!! Lauren, your kitchen looks absolutely fabulous! I am planning to paint my kitchen cabinets in about a month, so your post came at the perfect time for me! I can only hope that mine turns out half as good as yours! I love your style and your blog has certainly become a huge source of inspiration for me! Thanks for sharing! Looks beautiful! 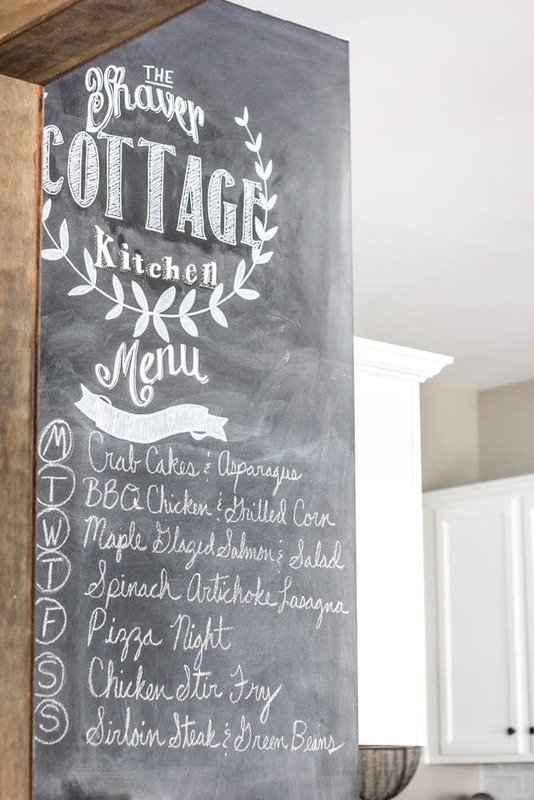 We are about to start doing this in our kitchen, using the same paint/color, so I appreciate the information! One question–how did you decide to use the satin finish over semi gloss? Seems that these are the finishes most often used for cabinets but I’m not really clear on the differences. Glad it could help, Sheila! I decided on satin just because I didn’t want super shiny cabinets, but it’s just a matter of personal preference. Semi gloss is more likely to show any imperfections too, but they’re also even easier to scrub. So you win either way really. Love reading your posts! May I ask what color paint you used on you kitchen and family room walls? What color do you use on your ceilings? Thank you, Gayle! The paint on our walls is Sherwin Williams Perfect Greige. The color changes dramatically with the light. It looks dark beige at night and medium gray during the day. It’s the craziest thing. I’m not sure about the color on our ceilings though. That was painted by our builder. Love your cabinets! Question.. did you use a finishing product like poly or polycrylic? I didn’t see one mentioned. I am wanting to paint my kitchen cabinets soon and I can’t decide on a kit like the cabinet transformations or to use individual products like you did. I am worried to not use a finishing product like poly or they would be prone to chipping or yellowing. Thanks for any help! Hi Alex! This paint doesn’t require a sealer at all. It’s built in to the paint. I looked into the cabinet transformation kits too, but I liked that I had more colors to choose from with the individual paint. 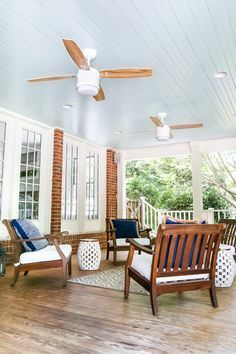 And this paint acts like an oil base in that it dries to a very hard, durable finish and is easy to scrub but it has the easy cleanup and low odor like a water base. Your kitchen is looking extraordinary in white paint. Wonderful post to consider. 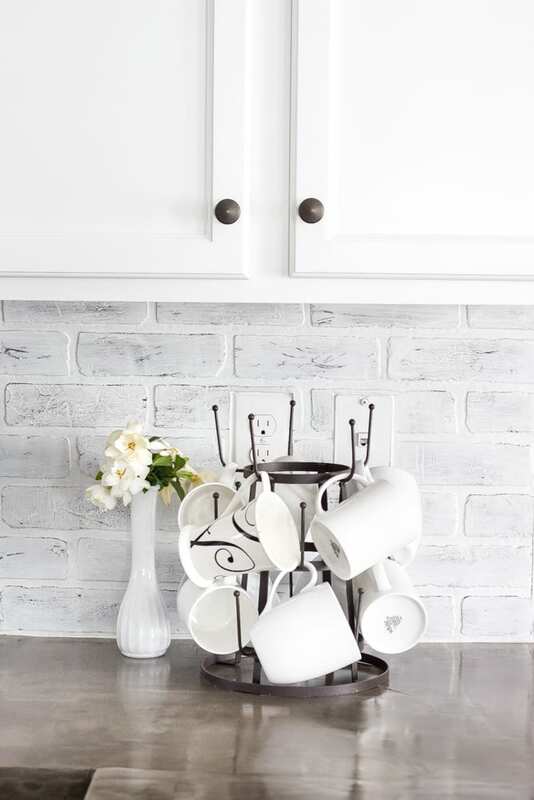 Your white fresh cabinets, kitchen decor, white brick wall , I mean each and everything is drop dead gorgeous. Your hardwork and creativity has really paid off in terms of love, love and more love for you. Thank you so much! We’re loving how much brighter it is now. 1. Since it’s a condo building, I don’t have a garage to paint in. Is it safe to use that sprayer indoors? I’m not sure where else I could do the doors except in an alleyway with tarps (kind of sketchy haha). 2. If you had used it on your frames, what would have been the process with the sprayer then? And how wide would your area of “protection” be (/how much space around the cabinets would you need to cover)? 3. How many days total did it take you to do the whole project? I don’t have QUITE as many cabinets as you do, but I imagine it would take about a week all together. 4. Would it be ridiculous to spread out the painting and do the top one weekend/bottom another? HI Lauren! LOVE the cabinets! 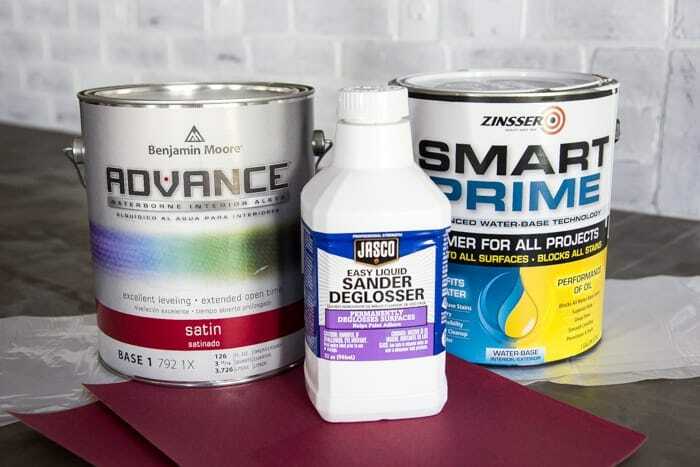 Did you only use one gallon of paint and one gallon of primer?We are repainting our cabinets right now and it looks like we might need (2) gallons of advance paint in order to do two coats. I am hoping maybe we can get away with one coat (since this paint is so darn expensive!) but we shall see! Thanks for asking that, Jessica! I need to go back and explain how much I used. So I did 1 gallon and 1 quart of primer and 1 and 1/2 gallon of paint. 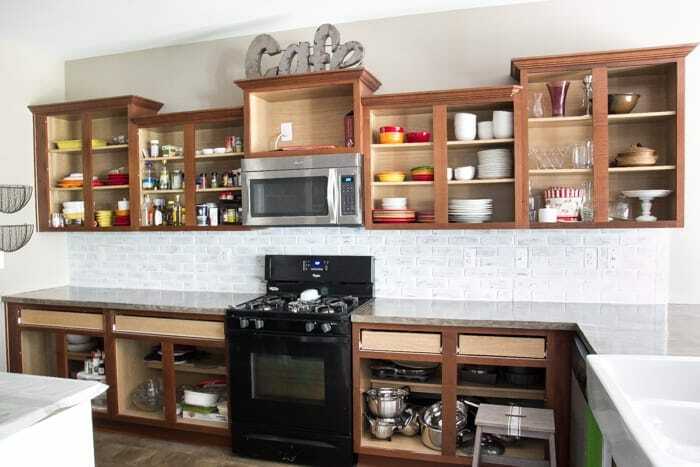 We have a LOT of cabinets, so you may not need as much if your kitchen is smaller than ours. Lauren, I’m painting our kitchen caninets soon and following all of your instructions thanks to this awesome post! 🙂 Curious how much paint you needed? Did one can do the job or did you need two? This looks great! I just inherited a pretty ugly builder grader kitchen and can’t wait to paint our cabinets. But I’m also in SC. Do you recommend waiting until the fall to do this job because of the humidity? Thanks, Casey! Yes, I would definitely wait until this crazy SC humidity goes away around September-October. Plus, it’s more bearable for you too. Dripping sweat on your fresh paint job is no fun. Haha! They look awesome! I wanted to paint my cabinets white for so long but for many reasons (including having a toddler/preschooler) I ended up paying a LOT more than you spent to have someone do it LOL. May I ask off-topic, what does your daughter do while you are working on these projects? I’d love to do some of these but that’s my main issue as a stay at home mom. Thanks! Thanks, Alexis! It took a LOT of patience. I mostly worked on them in the mornings/evenings when my husband wasn’t at work and on the weekend. So he was able to entertain her. I did all of the cabinets on my own. It probably would have gone faster if I’d had his help, but I needed him to play with her the whole time instead. It’s definitely a struggle balancing projects with being a mom/wife. You did an amazing job. It looks beautiful!! I have been putting off doing ours. Thanks for the tips now I can’t wait to start on our oak cabinets. I also love your counter tops! We desperately need new but $$ is a factor. Where did you get them and were they more affordable than other options? Looks fantastic! Thanks for all the detailed how-to. I’ve always been hesitant about painting my cabinets because of the sanding process. That seems so tedious. You mentioned it can be skipped? Would that work for all kinds of wood? Would the paint flake easier? How are yours holding up over time? It’s been 5 months since we painted them and they’re still holding up perfectly. 🙂 You could definitely skip sanding and just use liquid deglosser on a lot of wood projects. I use it on furniture makeovers quite a bit too. Were these solid wood? We have a very similar cabinet but I think they are vinyl? No, ours are a veneer. Did you use any wood grain filler? Can you see the wood grain through the white paint without using it? Or is that the magic of the Advance Paint? Thanks! You did an amazing Job. I was quoted $3,500 to have a painter do our cabinets. You may be swaying me to try it on my own. Are they still holding up well? How has the paint held up? Looking back, anything you would have done different? We sold the house and moved out two months ago, but they were still holding up great when we left, so just shy of a year since we had painted them. The only thing I would have done differently is bought those little painter’s tripods so that I could paint both sides of the cabinet doors faster and not have to wait quite so long between dry times. Beautiful job! I assume your cabinets are real wood. Ours our wood laminate. Do you think your process and products would do well on laminate? Hi Jessica! Yes, they should still work on laminate. The prep work and primer is key! Thanks, Linda! Nope! We will definitely still continue to blog in the new house. These cabinets took us almost exactly 1 week from start to finish. It was mainly lots of waiting around for drying time. Do you not need to add a gloss finish or top coat to seal the cabinets? Im debating about painting mine! Love yours! Im thinking light grey since i have white walls and white tiles! Hi Kate! No, if you use the Benjamin Moore Advance paint like I did, you don’t need a top coat. Sealing white cabinets is a bit tricky because adding a polyurethane can cause them to yellow. This looks amazing! I’m about to follow these instructions to re-do my kitchen cabinets from a similar wood color to white on top and navy on the bottom. 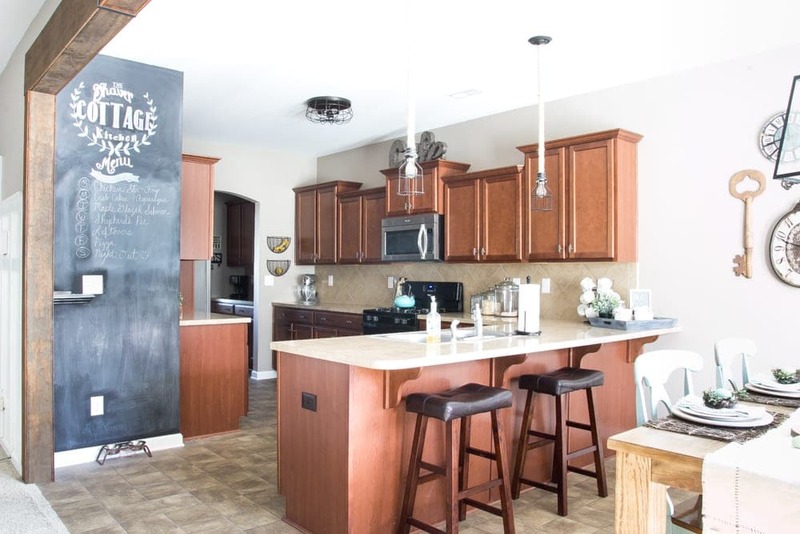 One question – did you also paint the bottoms and tops of the cabinets, or just the bottom/top edge? Like the others I am so happy I found your post! I was going to pack up all of my dishes. How did you manage to spray the cabinets and not get paint inside of them? Hi Terri! I only sprayed the doors in our garage. I painted the cabinet frames mostly with a foam roller to get them smooth. And the paint is self-leveling, so you can paint by hand and still get a good finish. It was just faster and less back-breaking to do the doors with the sprayer. 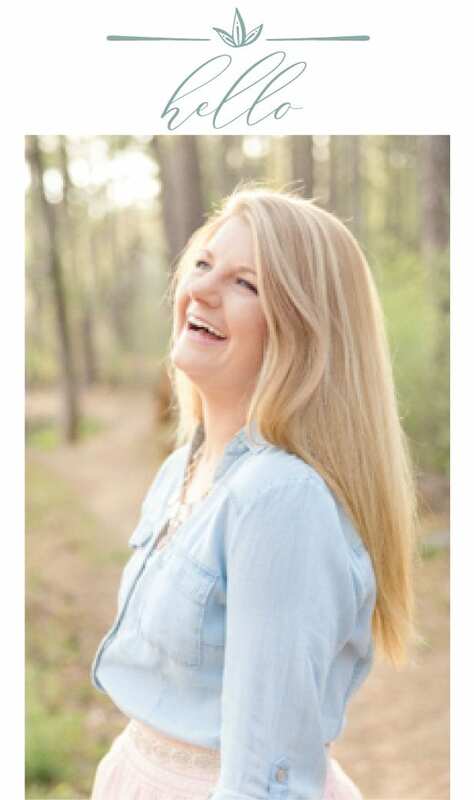 Hi Lauren, I hope I’m not too late in the game with comments lol. My husband and I are buying our first home and hopefully closing very soon! I want to paint the kitchen cabinets, but they appear to have be painted by the previous owner and may have a wax or glaze over them… would you recommend the deglosser or just straight up sanding down to the wood grain, then deglossing? And on a side note, we also want to paint the living room a brighter greige color and you totally have the perfect one in your home!! Do mind me asking what the wall paint color you used is? Hi Roxy! 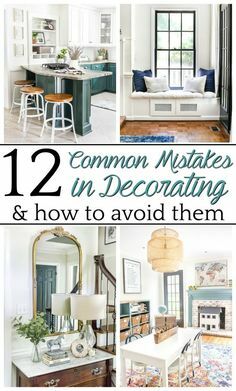 In that case, I would give them a light sanding just to get rid of any brush marks, drips, or blotchy spots, especially if it was a bad paint job to begin with. If you do that, you can skip the deglossing. Sanding is a lot more work, but the results will be well worth it if you’re starting with a not-so-great canvas. And yes! The paint color in the walls is Sherwin Williams Perfect Greige. It looks darker in person, especially without natural light. If you want a lighter option in a similar shade, Sherwin Williams Agreeable Gray is a great one. If you’re going to sand your cabinets I highly recommend getting an electric palm sander! I do a lot of wood work and started out the old fashioned way hand sanding many a board! When I restained a chest of drawers for my daughter just before her son was born I finally got smart and got my little electric sander. It saved hours of labor and my hands!! Just be sure to use the right grade of sand paper and a light touch! You can always go back take off more, you can’t put that perfect streak of color back on! Good Luck & Happy DIY’ing!! Yes! I love my mouse sander, especially for getting into corners and any small details. Hello! We are going to follow your instructions and paint our kitchen. We cannot find the Benjamin Moore Advance in satin finish in the color Simply White suggested. Do you have any suggestions for an alternative with the same look? Thank you so much! Hi Colleen. Hmm… that’s strange. You’ve been checking at the Benjamin Moore Stores and they don’t carry it? Hi Lauren. Beautiful job. Can you tell me how the paint is holding up after all this time? I’ve read mixed reviews on this paint on cabinets so I’m curious to see how yours is looking now. Hi Eileen! Ours held up beautifully all the way until the day we moved this past spring. So we didn’t see a single chip or anything for that whole year we had them. I would assume they’re still holding up. Hi Lauren. What’s the color of the walls? Please let me know! Thanks! The walls are Sherwin Williams Perfect Greige. did you have to seal the cabinets after you painted them? Nope! 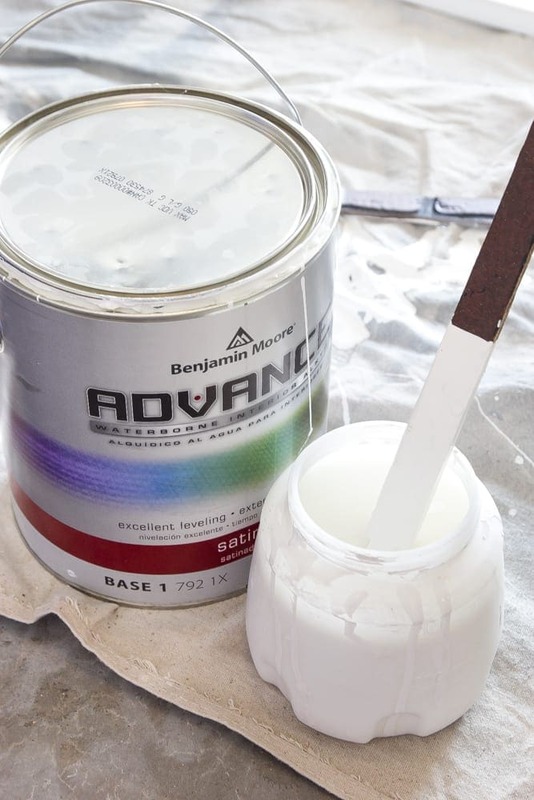 The Benjamin Moore Advance Paint we used doesn’t require a sealer, and actually I would steer clear of sealing with white paint since that might cause yellowing. Hi Lauren, I just wanted to know how your cabinets are holding up. How many years has it been? I also noticed that you didn’t finish with a protective sealant. Was the paint enough or would you recommend a clear coat to help protect the cabinets? Thanks in advance for any insight you can provide! Hi Amanda! We actually moved last year, but they held up perfectly for the entire year we lived with them. This particular paint does not require a protective sealant as they are enamel base and dry to a hard finish. A lot of sealants can actually yellow over time, especially on white. So I would advise against it, if possible. And it’s one less step to worry about. Thanks for the write up! 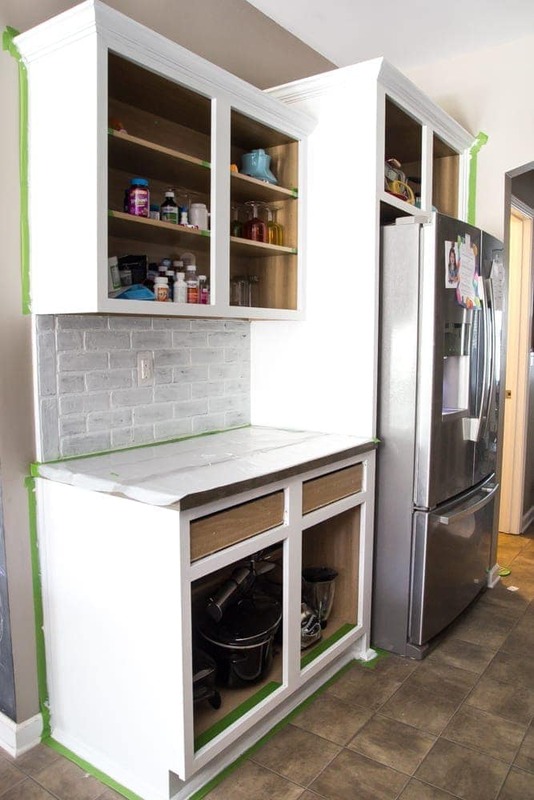 I am doing this to my cabinets next week, and did a little trial run today, however I am HORRIFIED at how spotty and splotchy the paint sprayed onto the cabinets…What is the fix for this? Was the paint to thick? FYI, I am using the same paint and sprayer….any advice?? Weird thing is that it did this the first time around. I bought the thinning tool and will use that next time around, and see if anything changes. 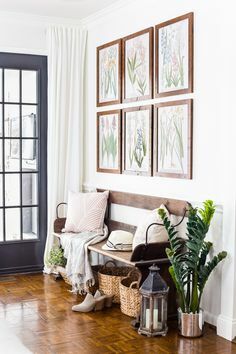 I am wondering what color white you might recommend for the walls if you were doing white-on-white. I love what you have here, too. Thank you! Hi Karena! We have white on white in our current living room. The walls are Benjamin Moore Swiss Coffee and our trim is Benjamin Moore Simply White. Maybe try that combo? Hi Lauren, cabinets and kitchen came our great! Quick question, did you notice any odor from the Benjamin Moore Advance paint you used? (They do state it’s low VOC) I’m getting ready to paint built-in bookshelves and was going to use BM Natura semi-gloss (used many times – has virtually no odor) along with BM paint extender. Thanks in advance. Hi Glenn! It’s been a while, but I don’t remember an odor at all. The primer did have a smell, I think, but not the paint. Hi there! 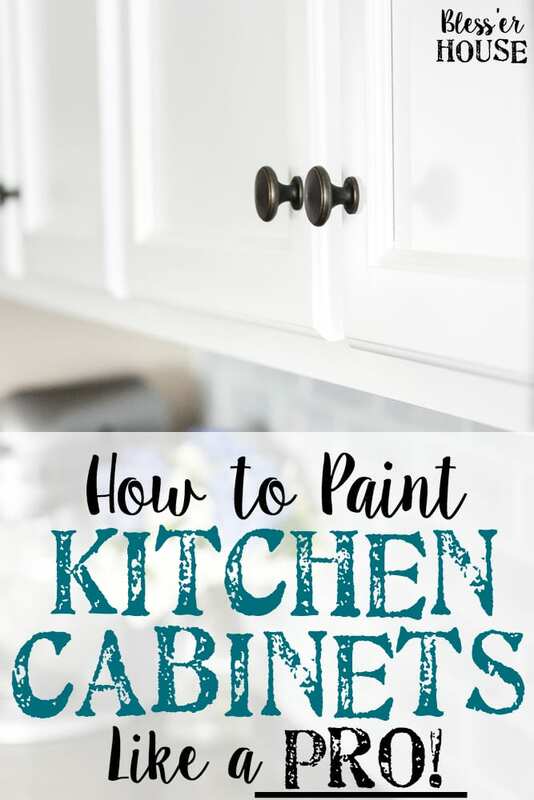 I ran across your blog and this tutorial while searching hundreds of how-to’s on painting cabinets. Yours in the before photo are very similar to mine, and I already knew I wanted to use Advance paint. I was sooo nervous, but am happy to say with the HomeRight sprayer (where have you been all my life?!) and your good instructions, my cabinets are so beautiful! Seriously, I can’t stop looking at them! A couple of tweaks I made…I used Stix primer and had the paint store add an ounce of white for better coverage. I caulked the cracks between the cabinet door panels and molding. Mine took four coats of Chantilly Lace, and I allowed them to dry four days before hanging. (I wasn’t hosting a cookout any time soon! 🙂 ) Thanks so much for your good help! I’ve referred anyone who asks how I did it to your blog! Hi Lauren, the kitchen looks amazing. I am getting ready to give my kitchen a makeover. I am nervous since I am not a great painter and want to do it on a budget. So if I mess up I am not able to replace the cabinets!!!! ?. I was wondering what made you decide to go with paint from BM rather than using a kit like Rustoleum? Over time did the paint chip especially around heavy used areas? Hi Martina! I did a LOT of research on the type of paint to use before tackling this reading up on professional cabinet painter forums. 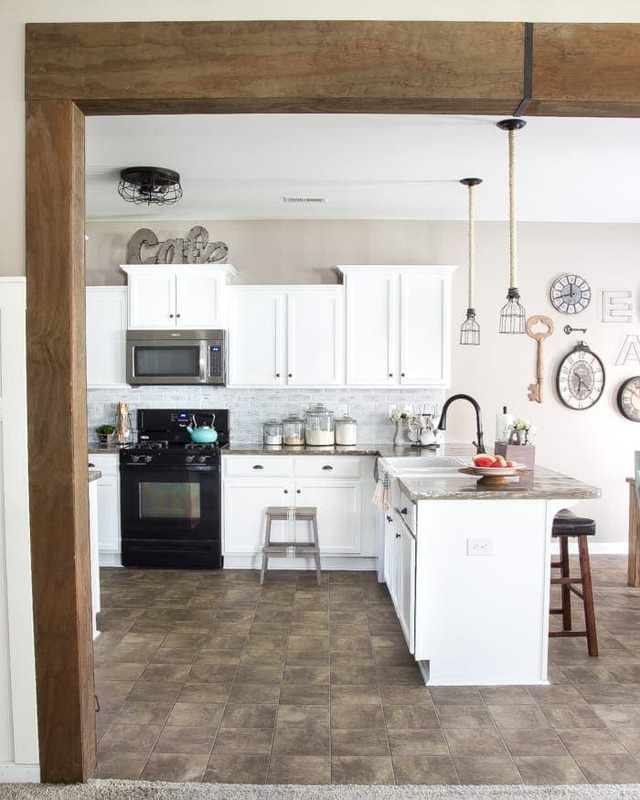 And Benjamin Moore Advance was by far the popular favorite by the professionals because it’s self leveling and cures very quickly to a hard finish. And there are way more color options with Benjamin Moore whereas Rustoleum only has a select few colors you can choose. We had no chipping issues whatsoever and lived there a year before we moved. I definitely think painting those cabinets helped our house sell quickly when we were ready to put it on the market. We used a sprayer on our kitchen cabinet doors, so that’s why we didn’t sand those. The sprayer made them very smooth already. But if you brush on the primer, I would definitely suggest sanding. Lauren, I’m getting ready to paint my cabinets. 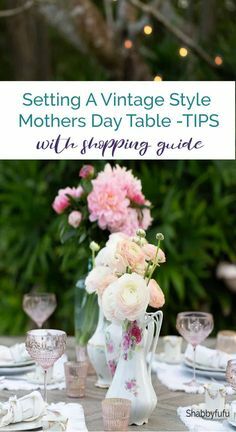 I initially was going to use chalk paint but it recommends using the gator hide (sealer). I’m not sure it can be used in a sprayer. Now I’m considering using BM. Did you seal the cabinets with a top coat? Hi Pam! No, the BM Advance doesn’t require a top coat. Just prep, prime, paint and you’re done. I love these cabinets and am about to take on the challenge, thanks to you! Thank you so much for the great tutorial. What do you do about the fake drawers that aren’t really drawers but look like a drawer and are fixed to the frame. How do you paint those? 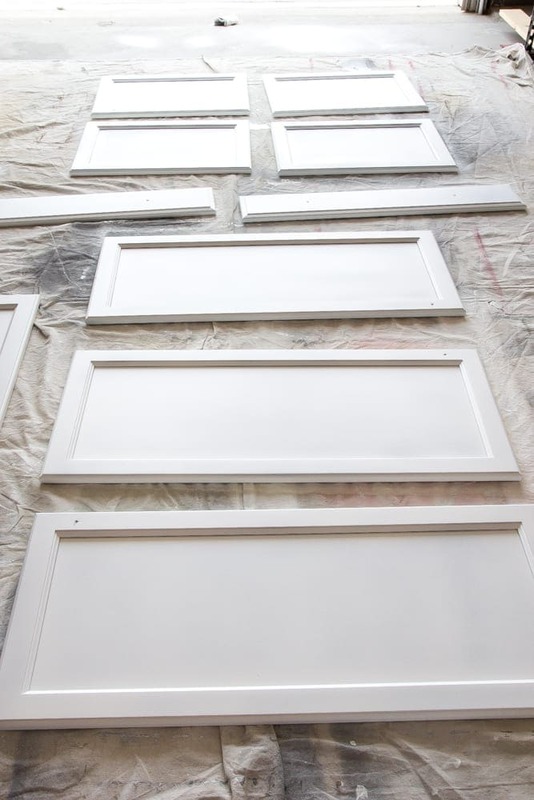 Paint them while you are are painting the cabinet frames. This was perfect timing! I’m getting ready to do our bottom cabinets. Did you thin the paint w 5% water because you were using a sprayer? My husband just bought one (YAY!) and this will be my 1st time using it. (AHHHHHH!) THANKS!! Yes! The thinning is just so it will be easier to apply with the sprayer. Otherwise, no need to thin it. Sprayers are definitely HUGE time (and back pain) savers! Absolutely Awesome! I LOVE how your kitchen turned out and your little girl is precious!! I had my house, an older model double wide I bought from a friend after my divorce, upgraded once I paid it off. The contractor painted my cabinets, which had been a dreary, drab brown, a much brighter country white. 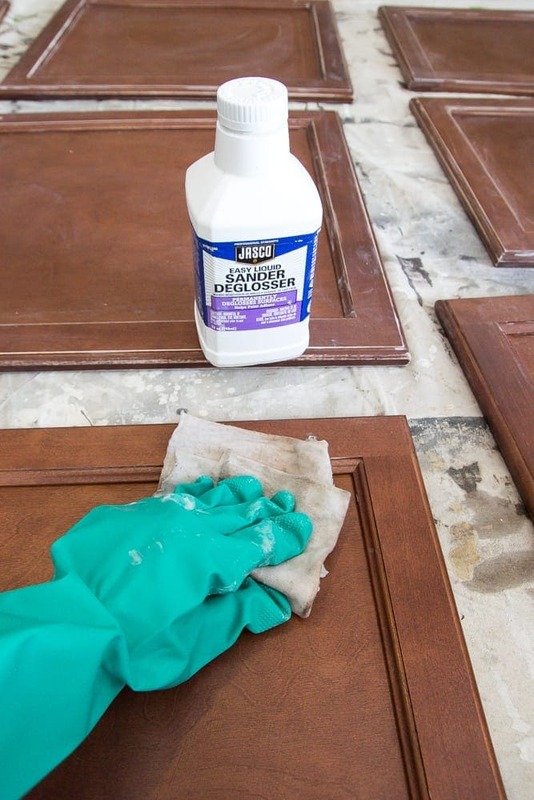 Using oil base paint to resist build up and make cleaning easier. Well that part was fine and I picked some colorful pulls to match the drumbeat red accent wall I chose to put on the opposite side (my brave move). Here’s where things went wrong. For whatever reason the rest of the pallet, which was fine with me, was done in the shade of the rest of my house, a neutral tan/gray called concrete thoughts. Looked good for maybe a couple of months until I noticed a build up. No matter how much I cleaned it wouldn’t come off that paint! Actually the more I cleaned I realized that paint began to come off too!! Yep, it was the same paint used in the rest of the house, not oil base to handle the grime of kitchen cooking, heat, etc. and I was stuck with it! with a window I would cover. Hi Vicki! We’ve done two backsplashes that were both super cost-effective to help cover up existing backsplashes we didn’t like too. 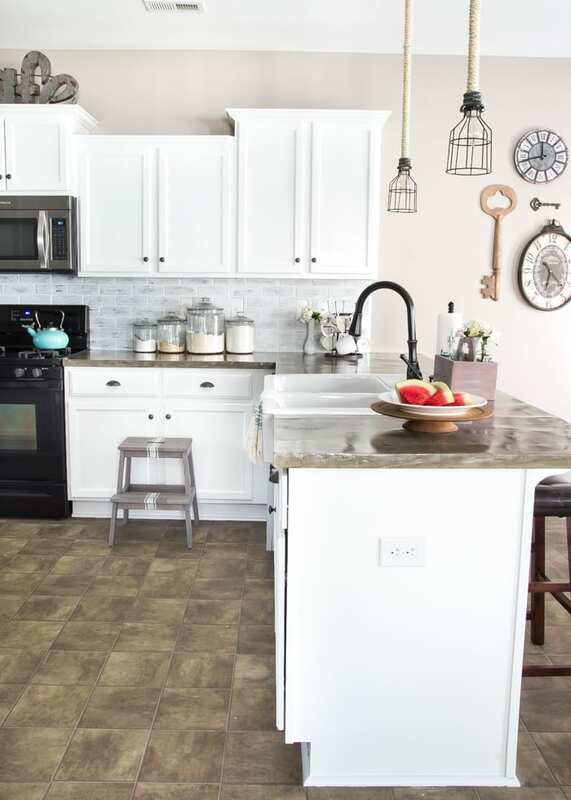 Here’s a faux whitewashed brick one we did: https://www.blesserhouse.com/diy-whitewashed-faux-brick-backsplash/ And here’s a faux pressed tin tile look one we did: https://www.blesserhouse.com/diy-pressed-tin-kitchen-backsplash/ I hope that helps! Your cabinets turned out great – such a bright improvement. My daughter & I will be using your tutorial to paint her kitchen cabinets starting next weekend. I have a question about keeping track of each door; how did you mark them while you were actually painting them to insure that you knew which door went where? The only method I can think of is to keep the marked piece of tape from each door, right next to it on the paint drop cloth. Yep! That’s exactly what I did. I sketched out my cabinet layout on a piece of paper and numbered each door (L1, L2, L3 for lowers | U1, U2, U3 for uppers) and I wrote that number on a piece of painter’s tape and stuck it on the drop cloth beside each cabinet door that I was painting. Just make sure not to paint over the tape with a sprayer. 😉 I put all of the hinges and screws in separate sandwich baggies with those numbered labels too so that everything would fit back in place exactly as they were before. Thank you! My sister and I will be following your tutorial this weekend as we paint the kitchen cabinets in my daughters condominium. I’m grateful for the detailed information you’ve provided. How many coats did it take with advanced. We are doing advanced white dove. First coat we still see alot of streaks. My fiance is getting nervous because she does not think it looks good but I am telling her its teh first coat. Usually around coat 3 is should really start looking good. We used a spray for the primer but for some reason BM advanced did not spray well so we went with brushing and rolling combo. Hi John! It took us 1 coat of primer and 2 coats of the Advance paint, if I’m remembering correctly. Benjamin Moore recommends to thin the paint with 5-6% ratio of water to work more easily in the sprayer. That first coat is always a messy looking doozy though that makes you question all of your life decisions. Totally been there. 🙂 I hope that helps! Hi! I was wondering if your cabinets were wood or laminate? I was wanting to paint mine but they are laminate and I’m scared it won’t hold up. Thanks! Is this paint such that you don’t need to use a finish coat of any kind? It looks FABULOUS – by the way! That is correct, Cas. And, thank you!! So I have a really dark kitchen in a five year builder grade home. I really want a white kitchen, but I also feel scared to paint expensive existing cabinetry! I’m scared it will diminish the house to have painted cabinets instead of the originals. Your post is the first I’ve seen someone paint builder grade cabinets. How did you come to the decision to paint them? The choice was easy for me. I really wanted to brighten the area. The value of our home was not effected in a negative way due to the decision. If you are really concerned yet really want to paint the cabinets, I suggest consulting with a local realtor. I hope you are able to get the kitchen you want while able to either keep the current value of your home or better yet, increase the value. I hope this is helpful. Wondrous interior, because the cabinets was well painted it gave a very refreshing look to the whole room. Nice article, thanks. So can you tell us how the paint is holding up over the past few years of use? They still look great! They wipe off nicely. Two thumbs up!! I have read your blog really very impressive about psychological preparation and graceful posting.Thanks for sharing your valuable information.